MURDER AND CLASSIC RADIO COMBINE FOR MYSTERY- NEW SINGLE SHOT- SHANNON MUIR’S ‘GHOST OF THE AIRWAVES’ DEBUTS! From Pro Se Productions’ Single Shot line comes a tale of mystery and murder set against the backdrop of the Golden Age of Radio! Through this stand alone digital single, Author Shannon Muir introduces the world to Ghost of the Airwaves! 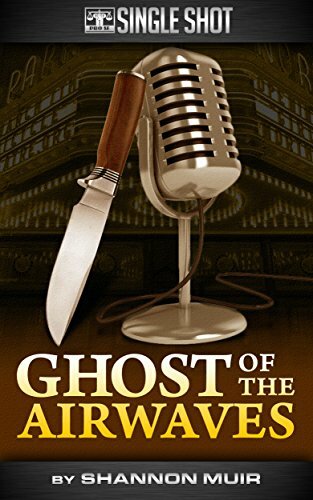 Ghost of the Airwaves is the suspenseful tale of radio actress Abigail Hanson, whose husband died under mysterious circumstances. Everyone believes the culprit is caught until a mysterious typed letter from "Ghost of the Airwaves" comes through her mail slot. Abigail becomes determined to find out who killed her husband and uses her own observant eye to help coax the police along. But, as she delves deeper into the mystery, Abigail may learn she should have stayed behind the microphone…to stay alive! Ghost of the Airwaves by Shannon Muir features fantastic cover art and logo design by Jeff Hayes and digital formatting by Russ Anderson. This haunting tale of mystery is now available for Kindle at http://tinyurl.com/otvexg4 and for most digital formats at http://tinyurl.com/oh7sw28 for only 99 cents. Ghost of the Airwaves - A Pro Se Single Shot Signatures series from Pro Se Productions. PULP ACTION HAS A NEW HERO- THE ADVENTURES OF DR. SHADOWS DEBUTS AS PRO SE SINGLE SHOT SIGNATURE SERIES! SECOND CHAPTER OF CORPUS VILE: DEATH IN THE CITY DEBUTS FOR 99 CENTS-RATS IN THE WALLS!